Where to start. It’s been a couple of days since the last report. I am now in Fargo, North Dakota and it is cold up here. Only mid 50s in the morning! There were a couple of stops between here and Marquette. First of, Marquette, the little place right on Lake Superior. I walked around town for a while and marveled at the restored old brick buildings. This used to be an iron ore and lumber town in its hay days. The road called and I intended to make it to Duluth, Minnesota. There, I would stay with a friend for a day to just relax a little and map out the rest of the trip. I drove thru more forests and past a bunch of lakes, some small other quiet large. I flew thru Wisconsin, took only 2 ½ hours to cross thru the northern part. However, I stopped in Montreal. As mentioned before, something had to give and it was Wisconsin, sorry. I made it to Duluth somewhere around 6 PM. 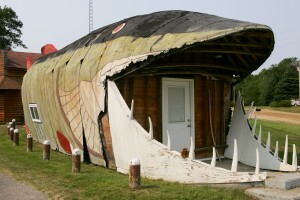 My friend has a house right on Lake Caribou inclusive of canoe and paddle boat. Got some rest and enjoyed the company as well as not having to drive for a day. All good things have to come to an end and on Sunday off I went again. More forests and lakes. Minnesota has over 10,000 lakes. 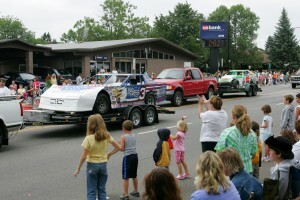 I was in luck, in Grand Rapids I stumbled across a street fair with a little parade. Looked more like a NYC block party, but size is not everything. 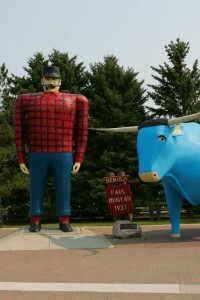 Made a minor detour to Bemidji to see and photograph the giant statue of Paul Bunyan and his bull Babe, call me crazy. I think I am ready for some flat land. Just east of Fargo the landscape started to change. The crops were low growing and the trees were almost entirely gone and replaced by shrubs. I stayed the night in a Motel 6, super clean and surprisingly quiet. The motel has only data ports and I don’t have a cable, so I have to make my way to a Kinko’s to send the e-mail. I am heading to the western border of N. Dakota before I drive south to South Dakota. It seems that I make it to Sturgis just in time for the big Harley rally and the Joan Jett concert on August 8. I will skip Montana and instead drive thru northern Wyoming to Yellowstone. I have campsite reservations for 2 nights inside Yellowstone. August 18. A few days there. Some more sightseeing in Washington State and than down via US 1 to San Francisco. I think I will be in SFO around August 24. I don’t know how much e-mail possibilities I have, so don’t be surprised if you don’t hear from me for a few days.